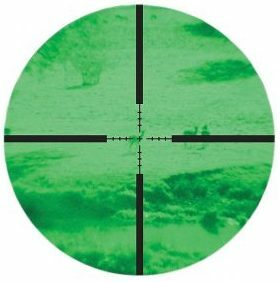 What Is The Best Night Vision Scope For Your Money? Home What Is The Best Night Vision Scope For Your Money? One of the most revolutionary pieces of gear to ever grace the world of hunting is the night vision scope. They offer hunters the ability to pick up precise shots in low-light or foggy conditions. Before night vision scopes came along, the only thing available on the market to help you achieve this level of vision at night, were night vision goggles. Needless to say, they weren’t very practical for hunting purposes; they often didn’t even work at all, and quickly were replaced with scopes. Now the market is flooded with night vision scopes of all shapes, sizes, and quality. Not only do you have so many choices to pick from, but the high-quality night vision scopes out there usually also come with a large price tag. Because of that, we have gone ahead and taken the time to review a few of the best night vision scopes on the market in 2018. You believe in being well equipped when you go hunting, right? So, why not be just as prepared when you decide to buy your next night vision scope? If you are on a budget, let us introduce you to the Firefield FF26014T. This is a tactical night vision riflescope that gives you the most bang for your buck without breaking the bank. 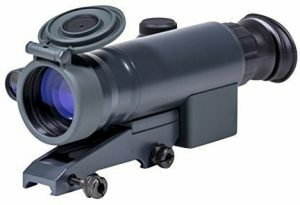 This scope is constructed from a durable titanium alloy housing that can take some rough handling and a few drops here and there. The sleek design of this scope reduces its profile a lot more than most other scopes in the Gen 1 range, also making it a lot less heavy than most as well. This ergonomic style makes shooting less of a task and more of a joy. The lens on this scope is a powerful 50mm build which provides you with super high resolution and increases its light gathering capabilities. The reticle is illuminated to give you even more clarity once you have zeroed in on your target. If the wide lens still isn’t enough to gather the right amount of light to give you a clear picture, there is also a built-in Pulse infrared illuminator to enhance the image you see through the scope. Wrapping up this scope, there are also precision windage and elevation adjustment knobs so you get a precise shot every time you pull the trigger. Second up on our list is another budget-friendly option; the Photon XT 4.6×42 night vision riflescope from Sightmark. 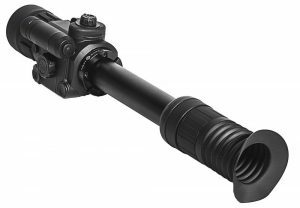 This scope is designed in a way that is meant to make it extremely versatile and about 30% lighter weight than any other digital night visions riflescopes on the market. It delivers higher magnification than other comparable riflescopes and features six different digital reticle options so it can be used for a wide range of applications from hog and varmint hunting to rangefinding and holdovers. The lens is a large 42mm objective lens that offers resolution as high as 640×480. At this level of resolution, you are getting crisp and detailed pictures at up to about 120 yards. Some shooters even claim that the crisp image it can give you a bit better than that of the comparable ATN X Sight II HD. It gathers ample light with no issue as far as we can tell, and is resistant to bright light exposure. On the body of the scope, you will also find digital windage and elevation adjustment knobs to help you hit your targets with the utmost precision regardless of environmental factors. Additionally, you can also make use of the built-in Weaver rail system. This system allows you to attach additional accessories to further expand the capabilities of the Photon XT. 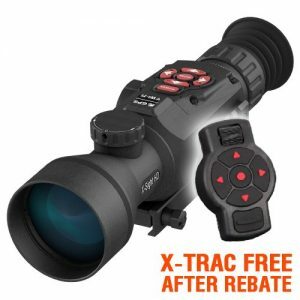 Looking for a scope that gives you a much better picture for your hard-earned money? 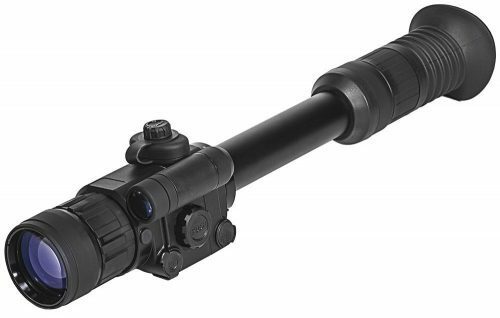 Take a look at the ATN X Sight 5-20 riflescope. The body of this scope is superb. Not too heavy, not too light, just solid and sturdy. It has no issue staying zeroed in and can take some minor rough handling and being jarred around. The lens of the ATN X Sight is where all the magic happens as it comes with a few nifty features. There is a day/night mode, a built-in rangefinder, a ballistic calculator, and a video capturing feature to allow you to record your best shots. All of these features will save you a ton of time and the hassle of carrying around additional range-finding equipment that you would otherwise have to deal with to do those same things. 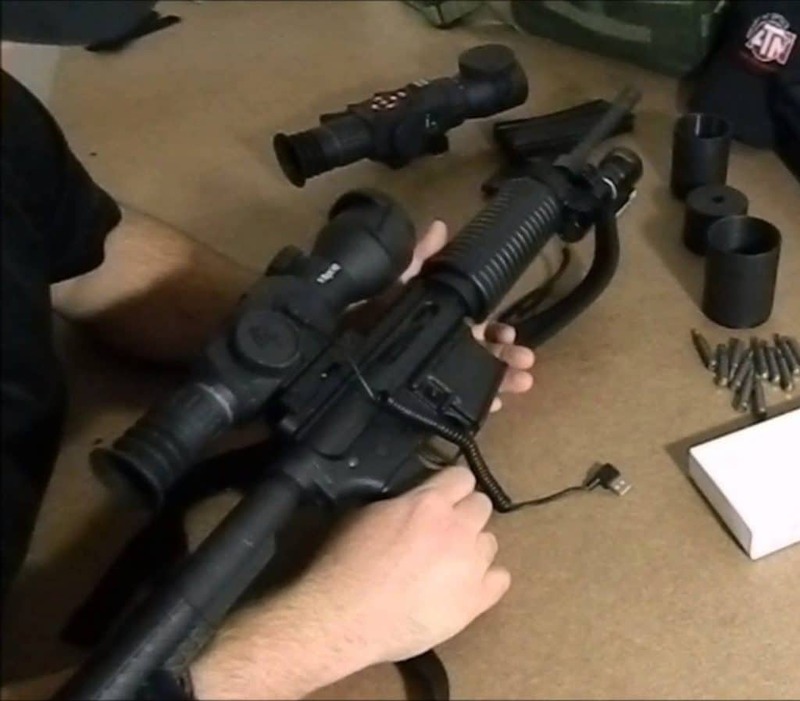 One of the most impressive features of this scope, though, is something called the Recoil Activated Video (RAV). This feature gives you the ability to record your best shots to video or capture still photos. These can then be shared with friends and family, or you can watch them yourself to study your shooting form and see what areas you need improvement in. 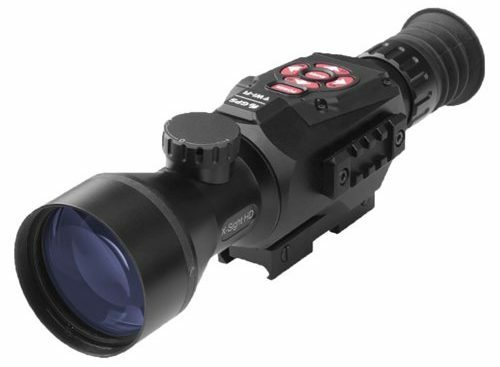 This scope is packed with a ton of features that are geared toward the nighttime hunter. The internal infrared illuminator has three different modes that can be adjusted to account for varying light conditions. But lighting shouldn’t be such a big deal anyway because the 50mm fully-adjustable lens on this thing is, dare we say… on par with a few Gen 2 scopes, we’ve messed around with. Zeroing in on this scope is probably one of our favorite features. Depending on what scope you currently own, you may find windage and elevation settings to be a chore. With the Pulsar N750, both settings are controlled with one knob. Just turn the knob to set windage, click the button, then repeat to set the elevation. There is also a digital zooming feature that allows for magnification from 4.5x to 6.75x, options for video output, a remote control that can be mounted just about anywhere, and a weaver rail for additional accessories. The overall build quality is solid and weighs in at 2.2 pounds. It will certainly put some weight on your rifle, but it’s a small price to pay for a good digit scope that you can rely on. The Yukon Titanium scope is what you buy when you need something extremely lightweight and durable. Something that can get the job down without trying too hard or be weighing you down with too much bulk. This is the smallest titanium scope that Yukon makes, and it’s one of the best in my opinion. The multi-coated 42mm lens is clear and gives you a crisp, high-resolution image. It does this by capturing as much light as possible, even in low-light conditions and the built-in infrared illuminator helps to further enhance the brightness you can draw out of the environment. The lens is a force to be reckoned with unto itself. it can be magnified to 1.5x power, has a full 20-degree field of view and has a yard detection distance of about 200 yards. The windage and elevation adjustments are spot on and simple to set with fingertip controls, there is a flip-up objective lens and has a Weaver MIL-STD-1913 rail mount for additional accessories, should you need anything else. Lightweight, low-profile, and tough… this is as good as it gets when simplicity is needed. There are a few main things that you should consider before buying a night vision scope for your rifle. Follow these basic guidelines and you should be able to pick out the best night vision scope for yourself in no time at all. Night vision technology has been around for quite a long time now. Night vision devices were being used as early as 1939 by the German Army during World War II. As a matter of fact, the first devices were being developed in 1935. Over such a large amount of time, night vision technology has gone through many different changes. With each new generation also came better picture quality, range ratings, and a better ability to gather light. Generation 1 optics were developed in the early 1960’s. They are not well-suited for use in extremely low light conditions. They will get you by on a dark night but they do need a bit of light to function properly. The main selling point for Generation 1 optics is that they are priced well for those on a budget. 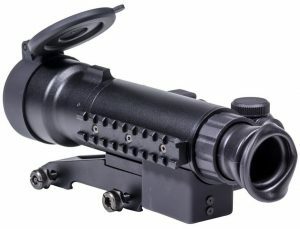 Generation 1 night vision scopes are best viewed as a general use scope. Generation 2 optics were developed in the 1970’s. This is where you will begin to notice not only better performance but also, an increase in the price tag. They do not require as much light as Generation 1 does in order to function. They give you higher resolution pictures and can perform well in extremely low light conditions. Generation 3 is the current generation. They are state of the art in the field of night vision and offer you the absolute best resolution available on the market today. They work well in extremely low light conditions and give you better range than the previous generations. The other major difference comes in the form of a price tag. 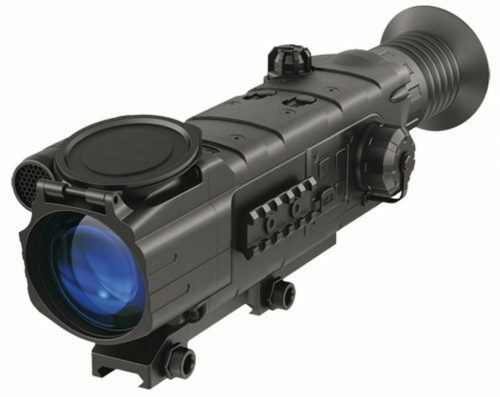 Generation 3 night vision optics are by far the most expensive available. 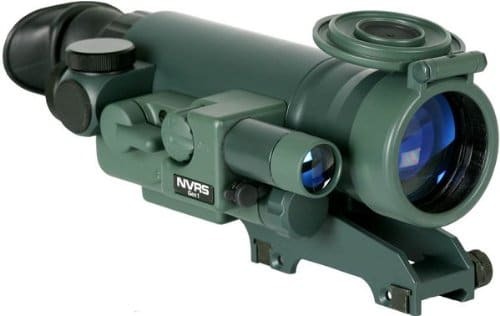 When it comes to the price of night vision scopes, it is fairly straightforward. Simply put, the price is highly dependent on what generation scope you are planning to purchase. The newer the generation, the higher the price. It’s as simple as that because as we explained above, with every new generation comes improvements over the previous. And these aren’t minor adjustments, they are huge changes in the overall night vision optic technology. You can easily go from $300 to $2,000 simply by jumping up to a newer generation scope. 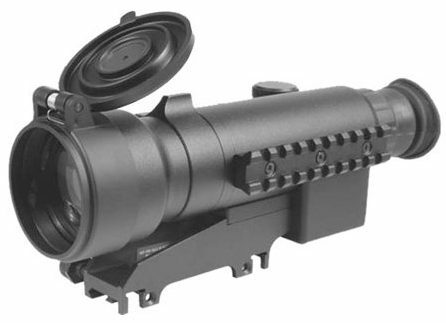 For those on a tight budget, we recommend the Firefield FF26014T. Weight is another factor that should have a large impact on your decision. You don’t want a scope that weighs down your barrel with unnecessary weight. But you also don’t want a scope that feels flimsy either. For general use out on the range or late night hog hunting trips, it probably won’t matter to you a whole lot. On the flipside, if you are going from thick brush to open field and everything in between, you sort of want something that is comfortable and not too heavy to carry around on your back. A lot of your scopes weight will come from things such as your variable knobs, extra focal lenses, and the material it is constructed from. For lightweight scopes, look for something that is in the 10-ounce range. If you go much lower than that, you are probably sacrificing sturdy build quality to shave off minimal weight. We hope that our review of the top 5 night vision scopes has helped you narrow down your choices significantly. Only you can decide which of these scopes are going to fit perfect on your rifle. Between our top picks and having the knowledge of what to look for when you buy a scope, you should be good to go. If you also do a little crossbow hunting in your spare time, you should also check out our top recommendations for best crossbow scopes as well.